“Demon: A Memoir” by Tosca Lee. BH Publishing Group. 328 Pages. I generally use two criteria to determine if a book is great or merely good. One of those is if the book can surprise me. The other is if I end up thinking about the book a long time after finishing it. The first is usually more common than the second, but both of them were present with my reading of Demon. I had never read Tosca Lee before. The main reason I knew of her is because she co-authored some books with Ted Dekker, who writes Christian suspense also. 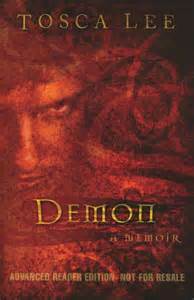 I had heard that Demon was the book to start with by her. And I am glad I did. The basic premise is that a mysterious man/woman who turns out to be a demon comes to a promising book editor and tells him that he was going to publish a book about the demons life. And the next few months are spent with the demon revising the editor time after time to tell him of his life from before the creation of the world until the present day. When the demon appears to the editor, it is almost always in a coffee shop or a restaurant, and the demon changes his/her appearance each time; this time a young man, that time a middle-aged woman. It took me a little while to get into the book, but about halfway through it really took off for me. This is not a book with edge-of-your-seat type scenes. It is more cerebral in nature. I compare it to The Screwtape Letters by C.S. Lewis. The retelling of history from the perspective of a fallen angel is a large part of the story, but the other part is how the editor’s life begins to fall apart as he gets obsessed with the new book he is trying to write. If there was any part that I had problems with, it would be that–at least at first–I had a hard time believing that the author was getting into the head of a man. Lee’s story would have the editor notice the appearance of men more than women, which is unlikely for a man. In addition, the details of where they were meeting smacked to me of what a woman would see, rather than a man. It got better as the novel progressed, but initially I had a little bit of issue with it. I talked about surprise. The ending is one that you can’t predict, and caught me totally off guard. At the same time, in retrospect it makes perfect sense. More than anything, Demon gives the reader a very fresh perspective on the ongoing battle between good and evil, from the very beginning to the very end. I found myself thinking both about the book and about my own relationship with God after completing it.